Panasonic's launching a pair of Toughpads that'll take none of your nonsense -- no matter what you throw at it. The FZ-G1 is a 10-inch version that runs Windows 8 Pro, while the seven-inch JT-B1 runs Ice Cream Sandwich. Both are following in the footsteps of the Honeycomb-running A1 and B1 that arrived back in 2011. Both are ruggedized to MilSpec standard 810G and should withstand immersion in water, have daylight viewable screens and the larger of the pair can even use a stylus with third-party apps. The FZ-G1 10-inch Windows Machine has a 1,920 x 1,200 display and is packing a 1.9GHz Ivy Bridge Intel Core i5-3437U vPro CPU, a 128GB SSD (upgradeable to 256GB), up to 8GB of RAM an eight-hour battery and an optional microSD slot. Connectivity-wise, there's USB 3.0 and 2.0 ports, Bluetooth 4.0, 802.11 a/b/g/n WiFi and optional Verizon LTE or 3G. The JT-B1, on the other hand, has a 1,024 x 600 display and runs a 1.5GHz dual-core TI OMAP 4660, 16GB storage and 1GB RAM, built-in microSD slot, 13-megapixel rear and 1.3-megapixel forward facing cameras and an eight hour, 5,720mAh battery. The larger of the pair will be available in March and will set you back $2,900, while the smaller one will arrive in February and will cost $1,300. Interested in knowing more, or just curious if you can use the hardware to knock down a few walls? Head on past the break for some PR. Las Vegas, NV, January 9, 2013 – Panasonic, an industry leader in rugged, reliable mobile computers since 1996, today expanded its Toughpad™ line of enterprise-grade tablets with the introduction of the Toughpad™ FZ-G1, a 10" tablet featuring Windows® 8 Pro, and the availability of the Toughpad JT-B1, a 7" Android™-powered unit. Both devices follow the original 10" Android-powered Toughpad FZ-A1 which became broadly available late last year. With the Toughpad (#Toughpad) family of ruggedized tablets, businesses and government institutions have a single partner delivering a selection of highly reliable and purpose-built devices ideal for numerous operational needs. "For nearly 20 years, Panasonic has engineered the most reliable mobile computing devices on the market," said Rance M. Poehler, president, Panasonic System Communications Company of North America. "Because our customers know they can count on our products to deliver performance and return on investment, Panasonic – through its Toughbook brand – holds nearly 80 percent market share in the rugged mobile device space. We believe our engineering acumen, vertical market expertise and reputation for reliability, backed by our world-class service, will result in the Toughpad family being the leading B2B tablet solution in the coming years." Dimensions: 10.6" x 7.4" x 0.75"
"Our Toughpad tablets were designed based on years of input from customers," continued Poehler. "This customer feedback is a critical part of the development process and will continue to shape Toughbook and Toughpad devices in the future. The wide variety of devices in the Toughbook and Toughpad families is a clear indication that we build products to meet our customers' needs." The 10" Windows 8 Pro-based Toughpad FZ-G1 will be available in March starting at $2,899. The 7" Android-powered Toughpad JT-B1 will ship in February starting at $1,199. The 10" Android-powered Toughpad™ FZ-A1 is now shipping, starting at $1,299. 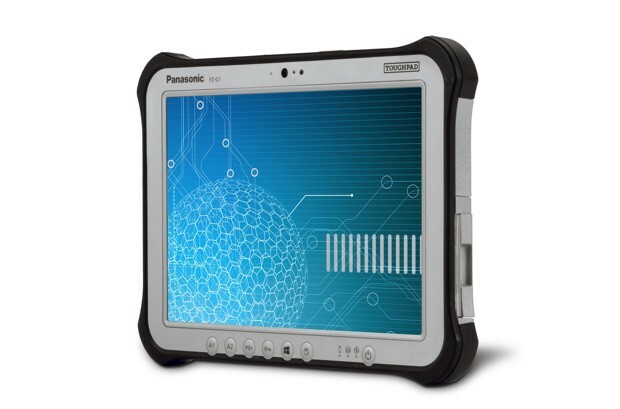 All Toughpad tablets can be purchased through authorized Panasonic resellers. Powered by Android 4.0 (Ice Cream Sandwich), the 10" Toughpad FZ-A1 is now certified on the Verizon Wireless 4G/LTE network.